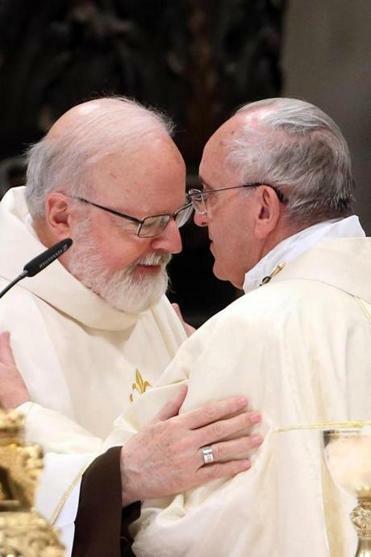 Cardinal Sean P. O’Malley with Pope Francis at the St. Peter&apos;s Basilica in Vatican City last weekend. “We are very pleased that our Holy Father had an important role in these negotiations. It certainly is part of the mission of the Church to promote reconciliation and peace between peoples,” O’Malley said in a statement. O’Malley was referring to US trade and financial restrictions that have been in place against Cuba for decades. The restoration of diplomatic relations between the United States and Cuba, as well as a prisoner exchange that secured the release of an American, was brokered in part by the Vatican. The involvement of Pope Francis had its roots in Boston — and O’Malley himself played a role, the cofounder of a Cambridge-based conflict resolution group told the Globe. Timothy Phillips of Beyond Conflict said his organization decided to approach O’Malley about a year ago, to see if the cardinal would be willing to ask the pope to become directly involved in efforts to normalize relations with Cuba. Phillips said he approached Boston ad executive Jack Connors, an O’Malley confidant, who put a meeting together between Beyond Conflict and archdiocese officials in March. The goal was to get the pope to bring up the idea with President Obama when he visited the Vatican, Phillips said. “Cardinal O’Malley was very receptive, and in the end, so was the pope,” Phillips told the Globe. What’s included in the US-Cuba deal? Latest stories and analysis from John L. Allen Jr.
Michael O’Loughlin and Ines St. Martin of the Globe staff contributed to this report.